Anacondas (Eunectes spp.) are commonly called water boas due to their semiaquatic natures. They are more agile in the water than on land; they even give birth to live young in shallow waters. The mother plays no role in raising her young; the babies must swim to safety after birth. Breeding time is quite a spectacle when it comes to anacondas. Unlike many species in which the males fight each other for a female, anacondas form large aggregations of up to 13 males per female. The males coil around the large female, who is much larger than the males. The males push each other while coiled in the breeding ball, trying to find the female's cloaca before the others. After a successful mating, the female may eat one or more of the males in the breeding aggregation. It is suspected that the female eats the males for energy and nutrients because she will not eat during her 6- to 7-month gestation period. Although anacondas give birth to live young, they are ovoviviparous, meaning they do not nourish the young inside their body. The young anacondas develop inside eggs inside the mother anaconda's uterus and are nourished by the yolk. Mothers are protective of their developing young during their long gestation periods. After her long gestations, the female gives birth to 20 to 40 live young, although a clutch of 82 young is the record. The size of the female may play an important role in the size of her clutch; larger females are thought to produce larger clutches. The neonate snakes are approximately 2 1/2 feet long and are able to swim and fend for themselves at birth. The Vancouver Aquarium website suggests that female anacondas may eat their young if given the opportunity. Neonate anacondas have a head start on life with their large birth size, but they are still subject to predation without the care of their mother. 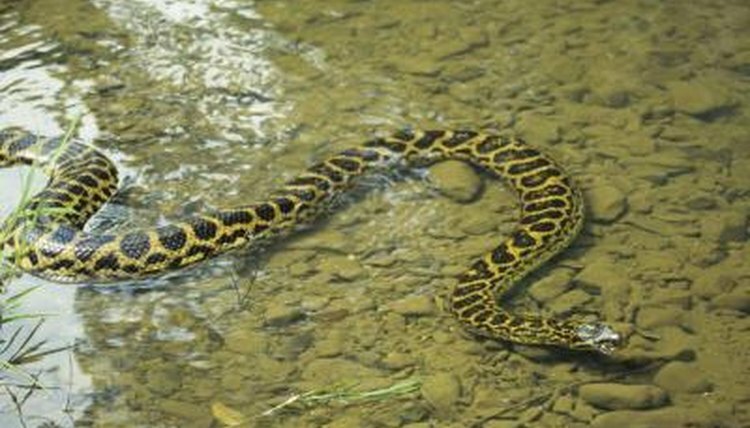 Although large adults have few predators, young anacondas are subject to predation by caimans, caracaras, crab-eating foxes, tegu lizards and larger anacondas. Dr. Jesus Rivas suggests the multitude of prey places an important pressure on fast growth in juvenile anacondas. Do Water Snakes Lay Eggs? What Is the Difference Between Male & Female King Cobras?